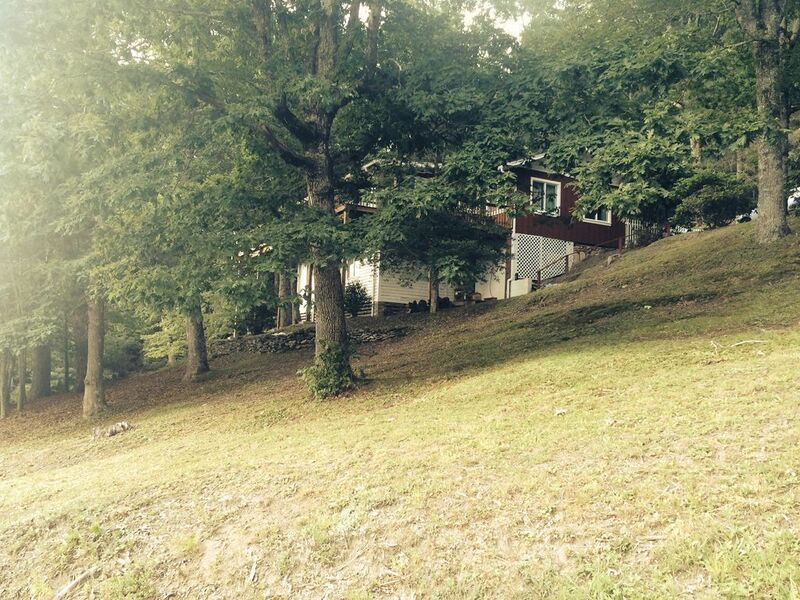 Beautiful Lake and Mountain Views, 3 bed 2 bath, gameroom, fullwrap deck & more! Life never seems as calm as it does when you’re at Weegee’s Lookout. 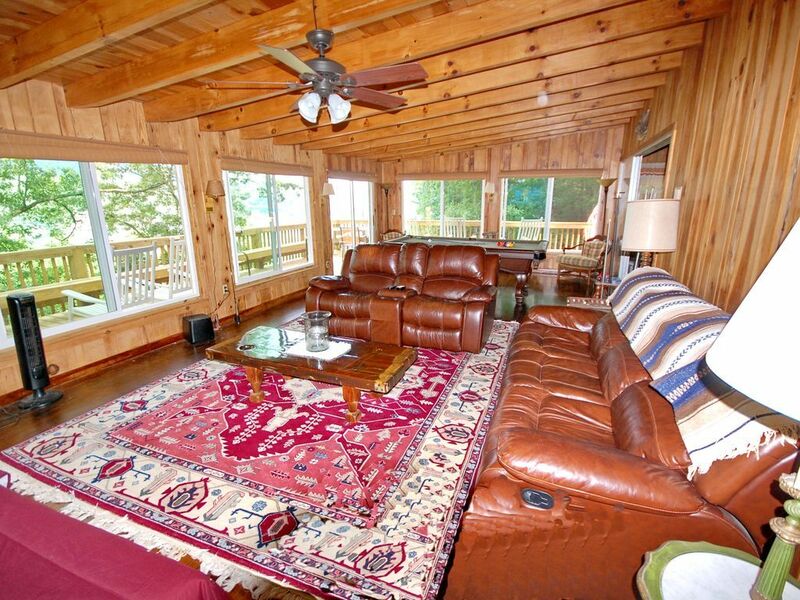 The tranquil oasis is nestled in the heart of the Nantahala National Forest just off route 107 on Tabletop Road. 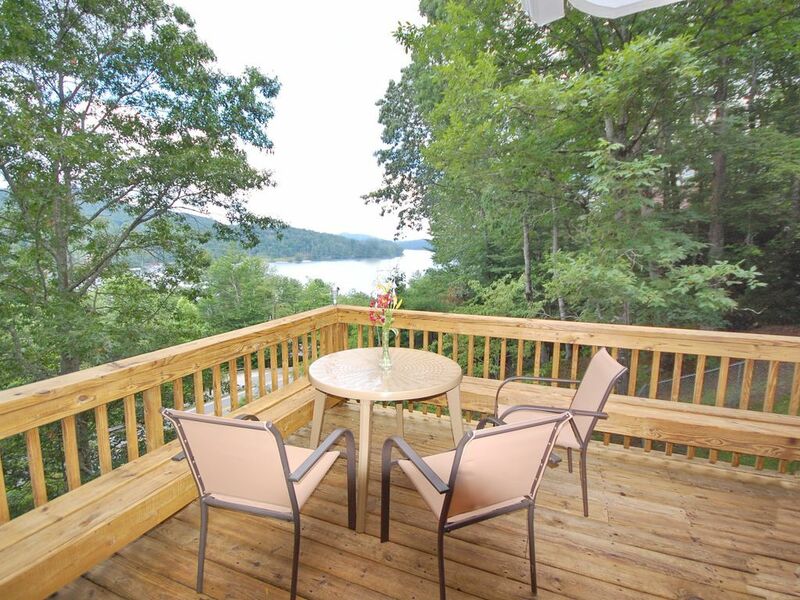 Seemingly in a world of your own, your day would start by lounging on the wrap around deck with a fresh cup of coffee overlooking Lake Glenville and the Smokey Mountains. The blanket of morning fog resting on the mountaintops instantly eases your mind into wonder and deep thought. Whether you want to spend the day exploring the wilderness around you or relaxing with your favorite book, it’s a must to end the day gazing at the sun falling behind the mountains. It’s truly hard to ignore one of the nature’s most mysterious scenic views. Weegee’s Lookout, named after my mother who adored the outdoors and all the beauty that surrounds the property, has a casual atmosphere that invites relaxation. While on the property, you and your family and friends are able to connect with each other and the environment, often without even realizing it, due to the scenic views and peaceful stillness. However, don’t be fooled by the serene ambiance. There are a number of adventurous activities for everyone in the family. Have an explorer in the group? The area provides miles of wilderness to travel and discover. Let your curiosity lead you to discover new wildlife and memories. How about a little daredevil? If your family has someone who wants to grab life by the horns and test the limits of their bravery, look no further than the bike trails and treetops just waiting for some company (but please make sure children are accompanied by an adult and safety procedures are expected). And for all those fish kids out there, there’s something for them too! Pristine rivers and lakes are ideal for swimming, water skiing and boating. Our private dock and Lake access you can drive to which is located just down the road off HWY 107. A great place to picnic, swim and park your boat. The crystal blue water is prepared to catch your fall off the rope swing or supply you with diverse fish to catch at your leisure. Oh, and grab your worn out shorts and head to the natural rockslides and mountain high waterfalls if you’re REALLY feeling gutsy. 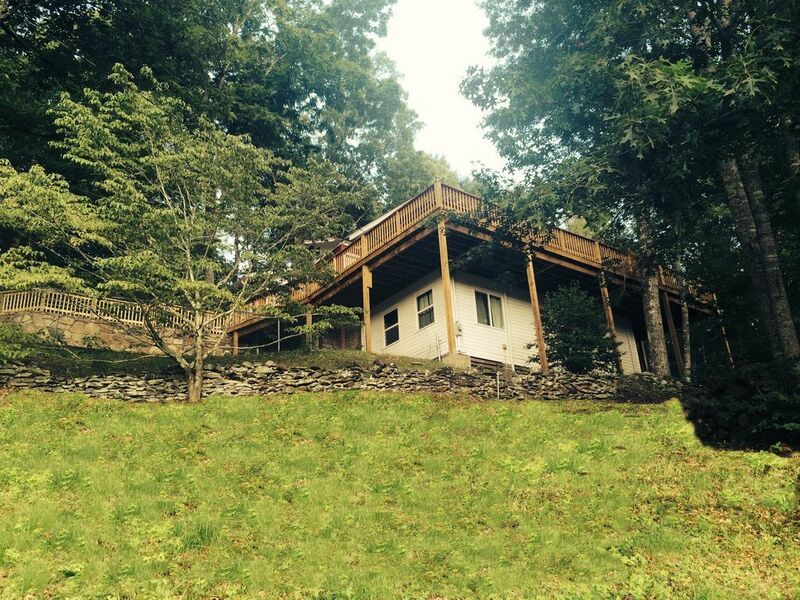 No matter your wants and needs, this mountainside home has something for everyone. On the first floor you can enjoy the family/living room with the warmth of a beautiful stone fireplace in the company of your love ones. 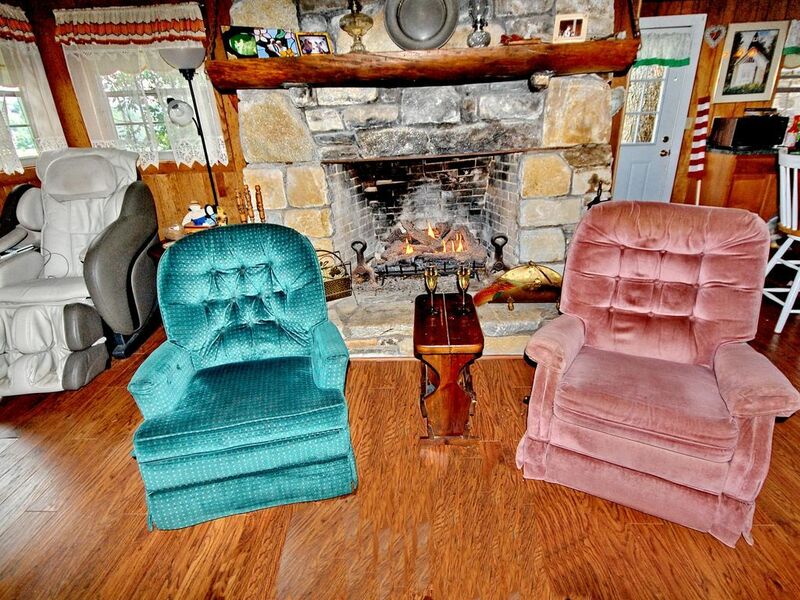 Sit around the fire playing games, sipping hot cocoa and making amazing memories with your family and friends. 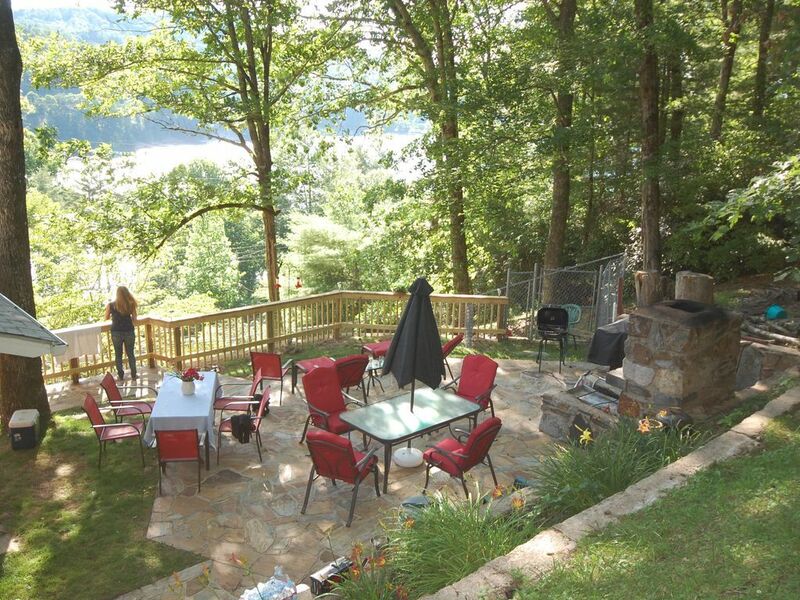 And during the summer, you can dine outside on the outer decks or on the beautiful stone patio, which has spectacular views of Lake Glenville and the Great Smokey Mountains. 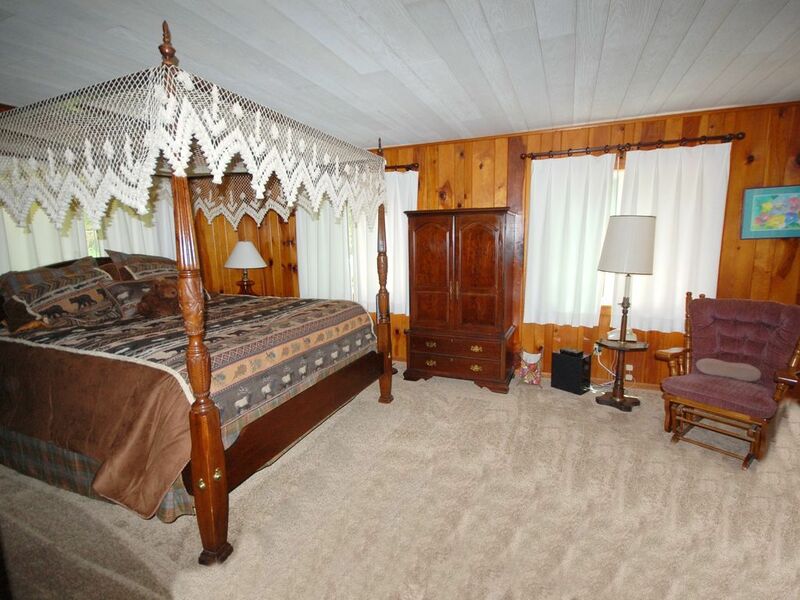 The spacious master bedroom is also located on the first floor, where you can enjoy the comfort of rustic wooden walls and a canopy king size bed while watching a 55” hi-definition flat screen TV. 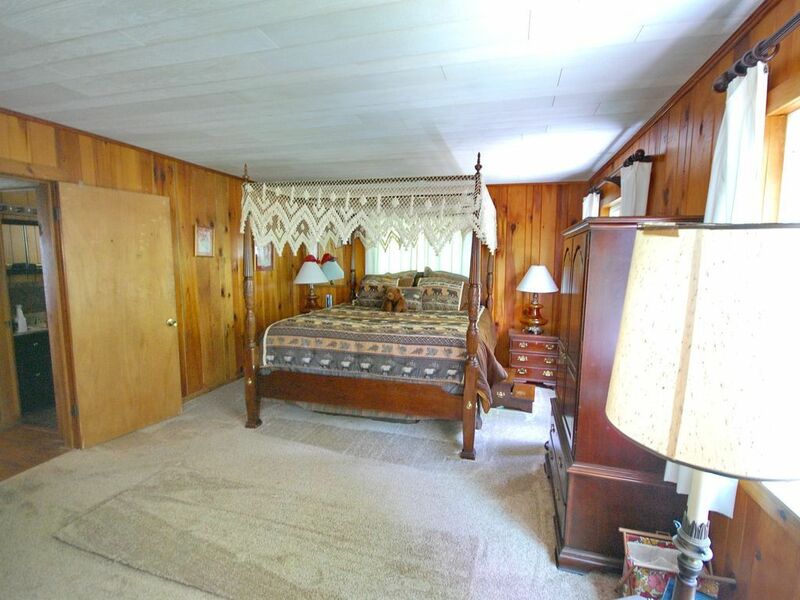 You will find a newly renovated bathroom adjoining the master bedroom. Another first floor amenity is a huge game room, which houses a pool table, a 65” flat screen TV with a sound system second to none, Wi-Fi, and very cozy seating area for the gaming observers. The bottom floor has two guest bedrooms. The largest one is ideal for children and/or teens with two twin size bunk beds. The room can accommodate up to four people. 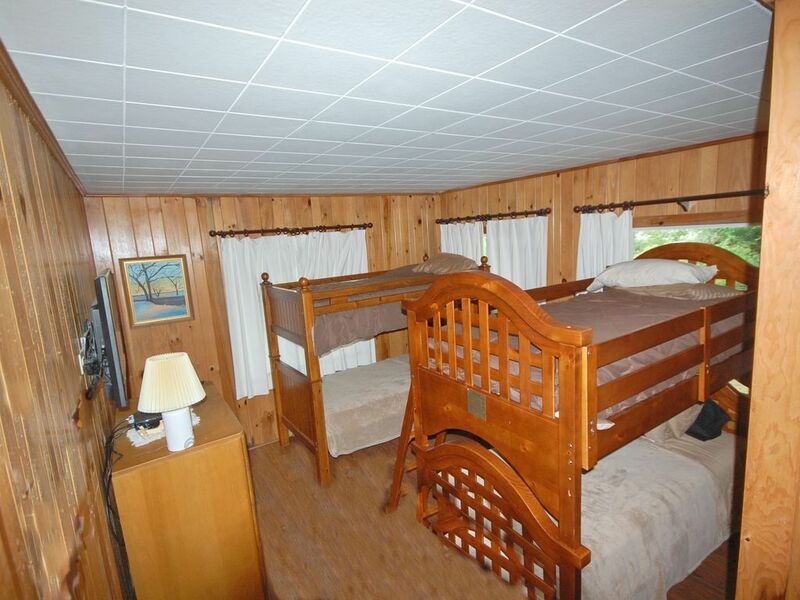 The second guest room has a full size and twin size bed. Both bedrooms on the bottom floor have a flat screen TV with satellite and Wi-Fi. There is a newly renovated bathroom located between the two bedrooms. Heating elements have recently been added downstairs for the cooler months. 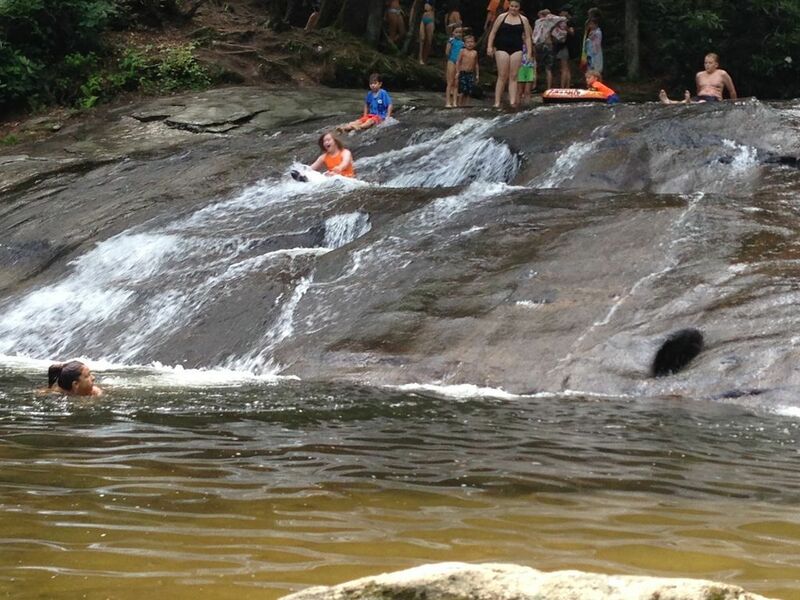 Weegee's Lookout is close to tons of beautiful waterfalls and mystic trails to hike, one of our favorites is Panther Town located in the Nantahala National Forest. 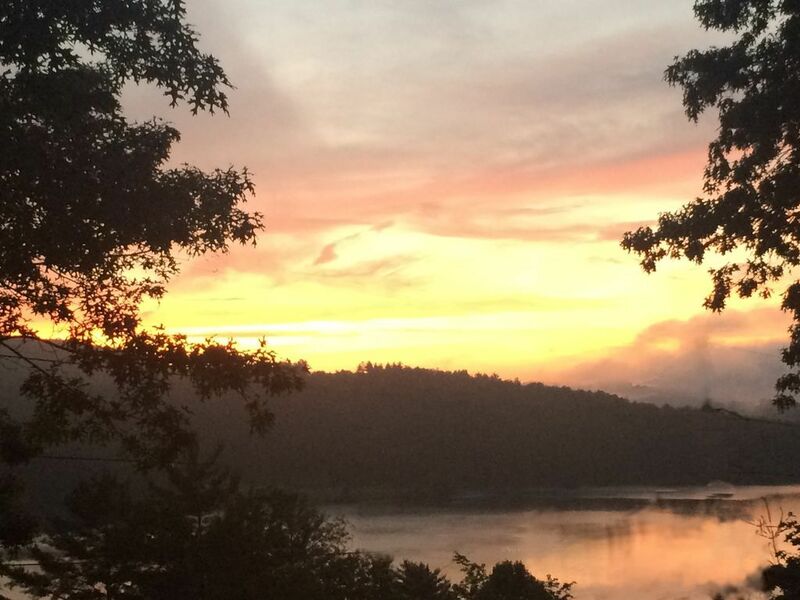 Only ten minutes from Cashiers, where there are nearby grocery stores, shopping, banks and everything you need to enjoy this beautiful town. In the center of town, there is also a wonderful play park with an amazing playground for the children. We are only 20 minutes from the beautiful town of Highlands where you can find more shopping, restaurants, and churches, banks, waterfalls, hiking trails and so much more. And lastly, you’ll only be 60 miles from Ashville, where you can visit the popular and remarkable Biltmore Estate and Winery. You are truly surrounded by gorgeous scenery and things to do in every direction when visiting Weegee’s Lookout. We look forward to meeting you and sharing our sacred peace of Heaven! Trout fishing, scenic hikes, whitewater rafting and gorgeous mountain vistas are waiting for you in a spacious 3 bed room home with huge game room and entertainment center with big screens TV's throughout all rooms. 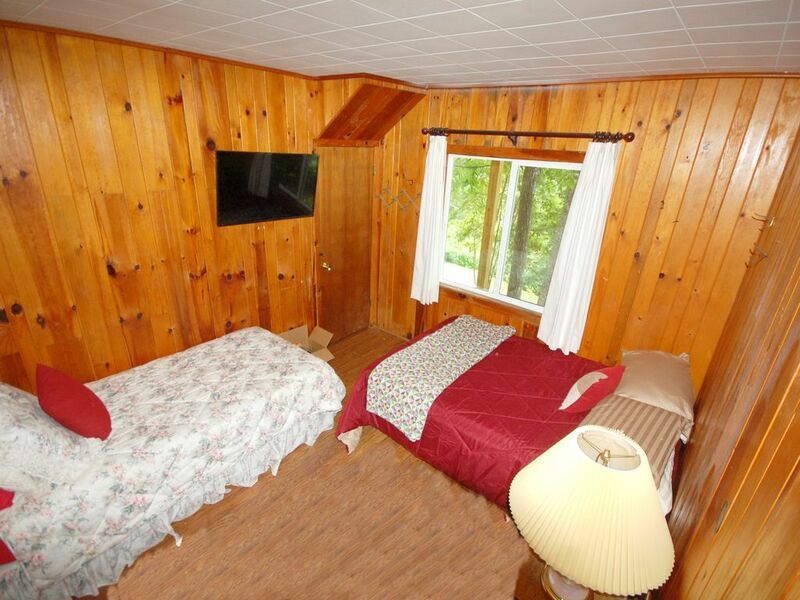 Large master bedroom with rustic wood walls, king size bed, with a 55' flat screen TV with Dish TV and Wi-Fi. Master bathroom adjoining the master with either master bedroom entry or there's an additional door to hallway entry as well. Both can be closed to your specifications. 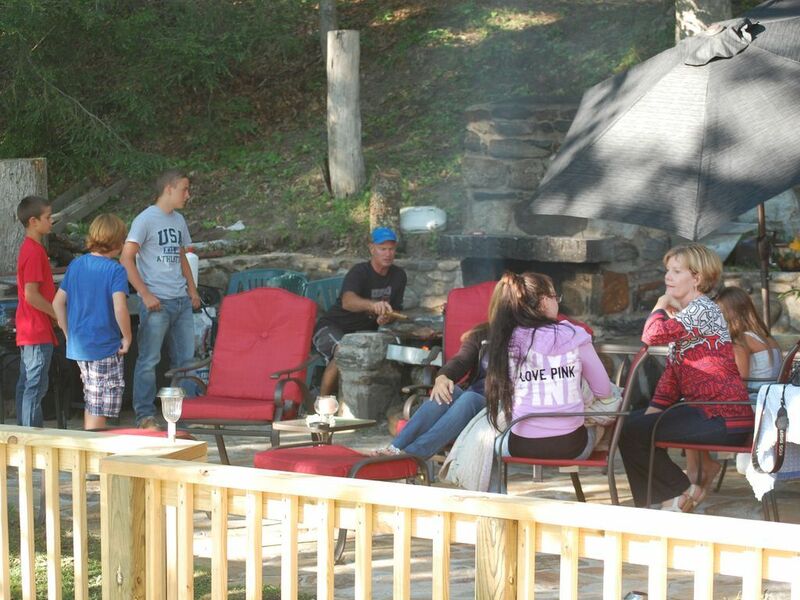 Our family thoroughly enjoyed our stay at your cabin. The view was fantastic, the weather was perfect the entire week, and everyone had a wonderful time! This one will go down as one of the best mountain trips we've ever taken. Thank you again for sharing your cabin. 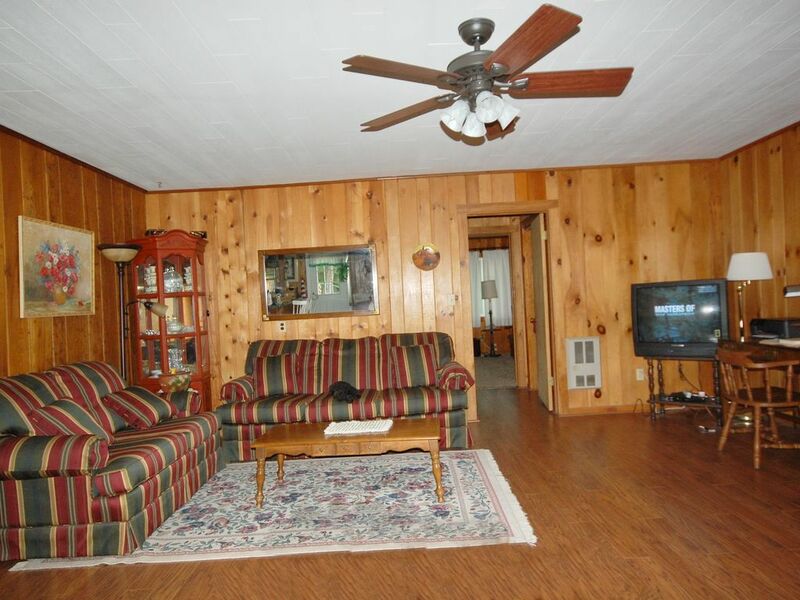 The cabin was clean, and the living area is well laid out. The outdoor eating area and pet area are great. It is close to several antique shops, waterfalls, and trails. 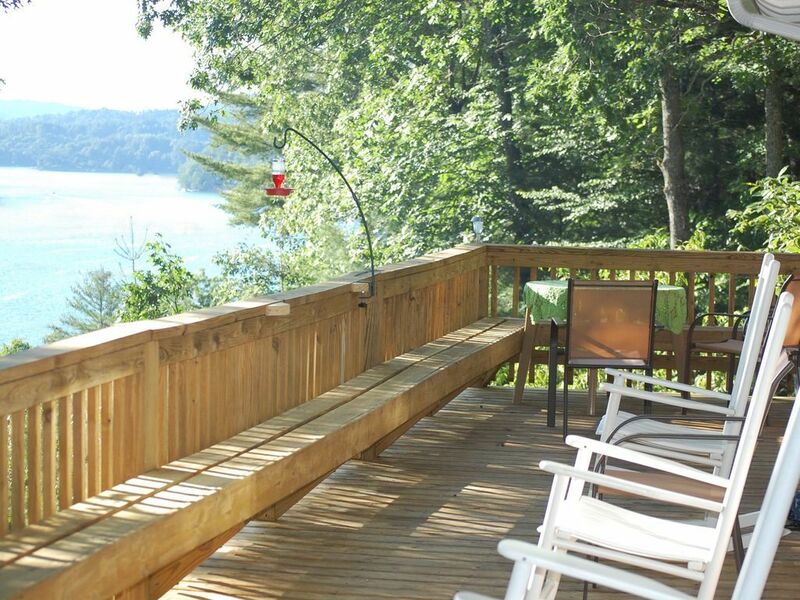 The views from the back porch of the lake and surrounding woods are fantastic. having rented site unseen didn't know what to expect but was pleasantly surprised. Not fancy but very nice vacation home. Very easy access to the lake and boat rentals. The internet access and phone reception excellent. 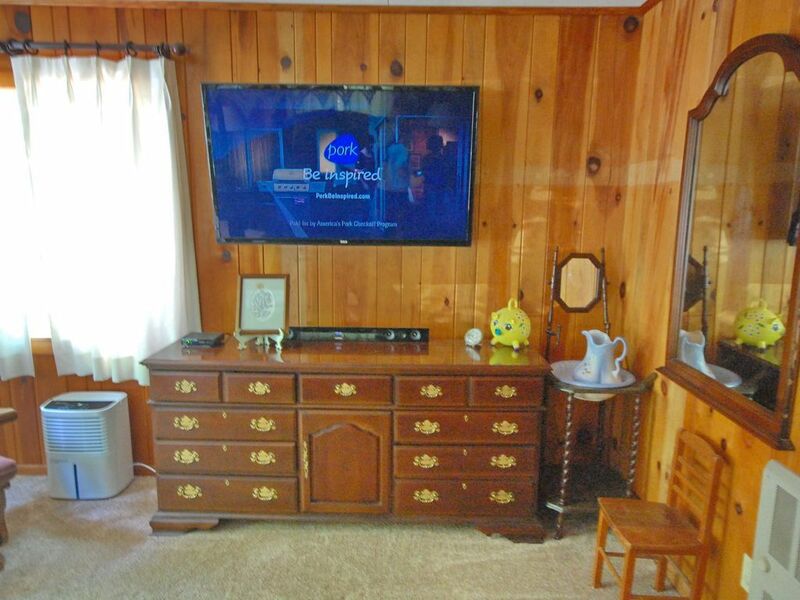 TV's and numerous other amenities for the kids. 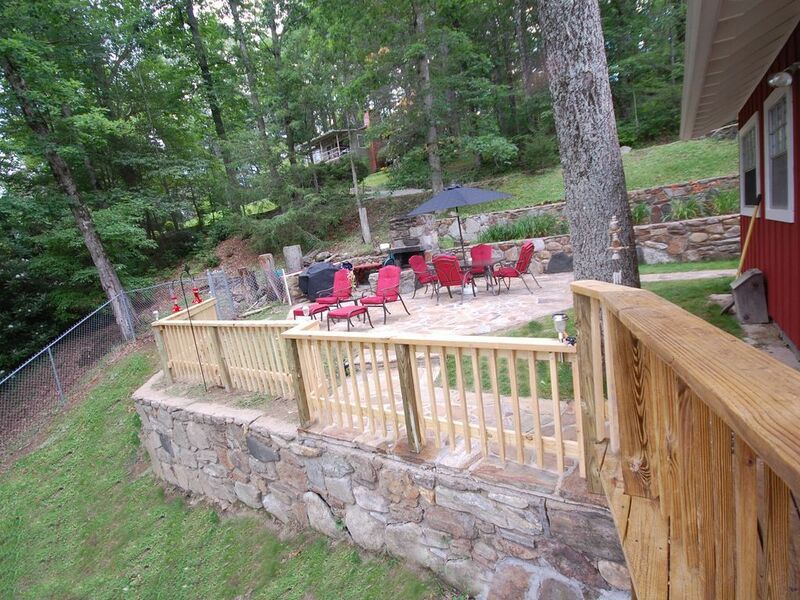 great views from the wraparound porch and large patio for entertaining and cookouts. EZ access to Cashiers, Highlands,Toxaway etc. Highly recommend. We enjoyed our stay at Lake Glenville. We had a group of five plus two dogs and the house was set up with everything we needed. There is a nice dock down the street for swimming and sunning. We did an afternoon cruise on a pontoon boat and whitewater rafting on the Chattooga. 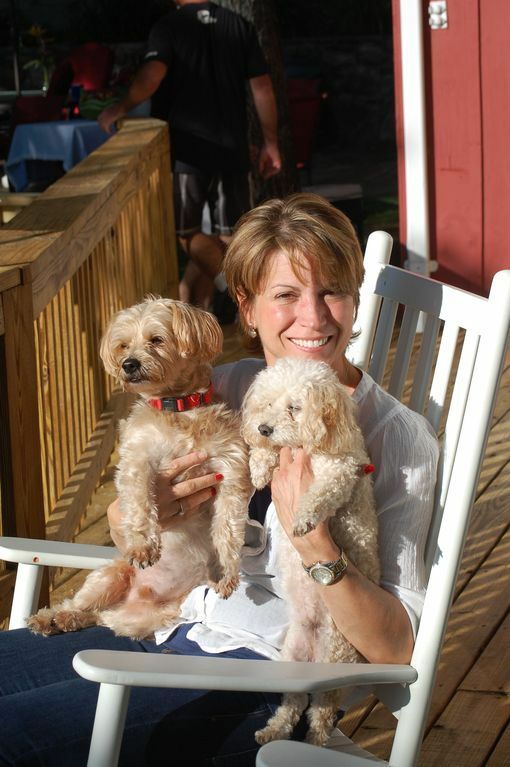 Good restaurants in Cashiers and in Highlands. My husband played golf twice. The air temperature was 20 degrees cooler than Atlanta. Enjoyed our morning coffee sitting on the deck and an evening fire in the outdoor pit. Would go again. Only problems - the internet did not work and there are some power lines that obscure the lake view. Beautiful home , great location and magnificent views ! Wow....the pictures don't tell the whole story . This home is very comfortable for the entire family and the dog ! 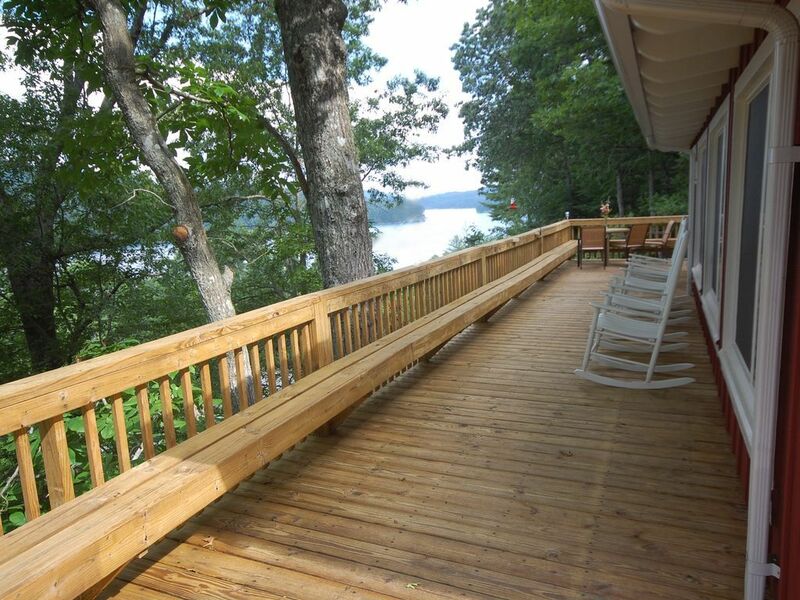 The views from this home are beautifully lined with mountains , trees and Lake Glenville . We hiked close by , enjoyed 3 waterfalls on the lake by a huge pontoon boat (swimming and tubing also) and then drove to some astonishing waterfalls nearby. Sleeping arrangements are plentiful . The pool table was a huge hit for everyone !! I really enjoyed the patio with the fireplace as we cooked out , played cards and just spent quite time watching the hummingbirds drink out of the feeders. Scott and Sherry are readily available if needed and a pleasure to work with for an awesome vacation ! I would recommend your home to anyone ! As for me and my family from 14 to 86 years of age , this was a big thumbs up...Thank you and we intend to be back again and again ! Be blessed !! Our family of five, which includes our dog, took our first family vacation in 15 years and this was the perfect home and setting to do it in. The house is beautiful, minimal road noise, with beautiful views all around. We could not have found a more perfect place to relax and enjoy one another than this house. There are two boat rental facilities right down the road and we had a wonderful time on the lake during our stay. Grocery is located in Cashiers not far from the house. The amenities in this house were wonderful and the owners could not have been more accommodating and nice. Our son did not want to the leave the massage chair. : )) We can't wait to plan another vacation and would definitely recommend and return to this house without a doubt! Beautiful Cabin with breath taking views of the lake. This is the perfect place to vacation for any length of time. We had a very relaxing time with lots to do! water activities, hiking, sight seeing, and fishing. Grocery store and shopping were close. Very clean and comfortable. 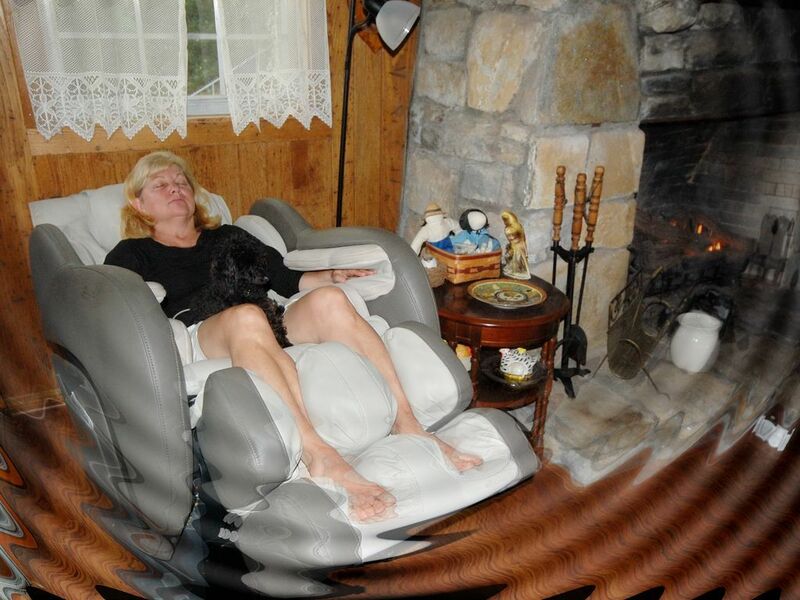 They had every day comforts of home, cable, internet, fully equiped kitchen, and oh yes the full body massage chair that helped take all life stresses away. Dinner on the patio and night fires made this extra enjoyable not to mention the beautiful weather and sunsets! 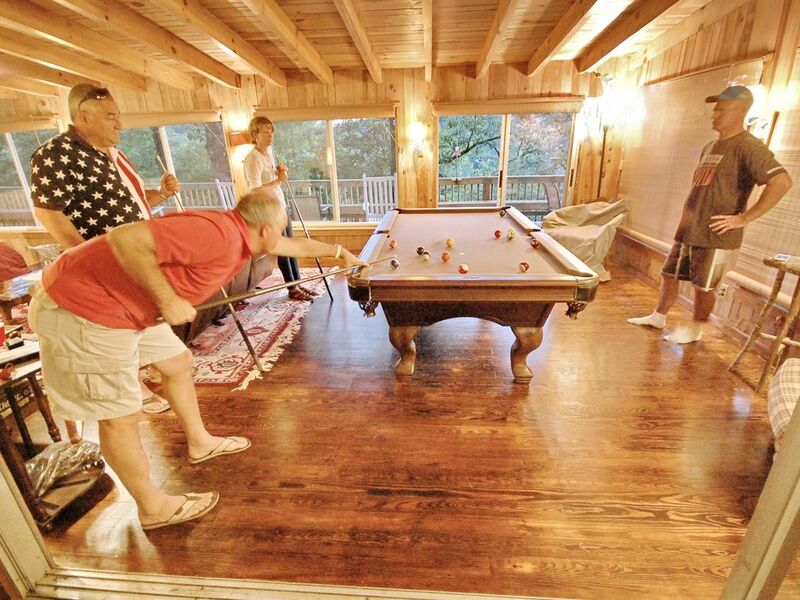 The pool table also helped keep the kids entertained. Can't wait to go and stay again. Sherry Lewis Or Scott Lewis 5617183922 Show Phone No.